← New Conquering Arthritis Site Up! The new e-book edition contains all the same healing information and recipes as the hard copy, but is set up for instant download and easy-anywhere accessibility. Now you can review your allergen lists or substitution guides on the go without carrying the 384-page book with you. And there’s more e-book availability to come! This entry was posted in Conquering Arthritis Specials and tagged conquering arthritis ebook, conquering arthritis kindle edition. Bookmark the permalink. 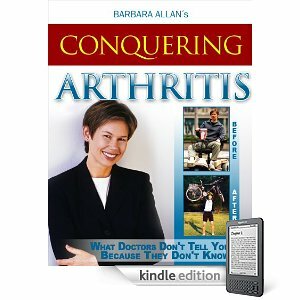 One Response to Conquering Arthritis Now Available on Kindle! I love topics about arthritis and that is because when you understand it more you know how to treat arthritis more effectively. Thank you I will buy the book soon.